Artists and musicians who appropriate existing forms and structures have diverse motivations and attitudes about the role of the original in their work. Some may use existing structures as a component of a new composite work, as is the case when Nick Didkovsky conceives of generative software that incorporates fractals. Others may explore existing structures as an architecture to be inhabited or exploited towards new purposes, as in the use of peer-to-peer networks in Jason Freeman's Network Auralization for Gnutella. When the very process of integrating structure becomes a significant part of the artistic practice, the composer faces a daunting challenge: to map or transform that structure as a fully integrated component driving a new work. The projects included in this section demonstrate a diversity of techniques and strategies in this regard, exposing different takes on retaining faithfulness to the original and foregrounding the transcriptive process. These works are inspired by structures from mathematics, circuit design, peer-to-peer file-sharing networks, and (in two cases) pre-existing pieces of music. And the transcriptive processes, in turn, rely on computer algorithms, chance operations, digital media destruction, user interaction, and human performance. Some of the works, such as Didkovsky’s MandelMusic and Essl’s FontanaMixer, help us to understand original structures in new ways. The works by Bünger, Freeman, and Perich, though, seem resigned to (or inspired by) the very limitations of the transcriptive process, which serves as a springboard for creativity and a tool for viewing source material from new perspectives. 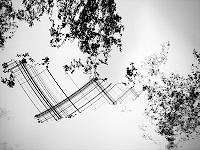 1-Bit Music, a project by composer and artist Tristan Perich, merges his interests in art and electronic music. 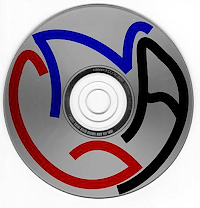 Perich programs and packages electronics in a standard CD jewel case that generates minimal glitch/dance music when headphones are plugged directly into the case. 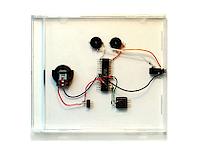 The music is “1-bit,” the simplest representation of digital sound. This “album,” which will be released by Cantaloupe Music later this year, will sit alongside other CDs in a record store, with 11 different tracks and a skip button. 1-Bit Music is not algorithmically generated, and there is no randomness in the actual playback mechanism; the music is the same each time it is heard. According to Perich, however, the limitations of fitting a synthesizer, sequencer, and the music all into one 8K microprocessor made machine, process, and algorithm critical to the creation process as well as the overall aesthetic of the CD jewel case. The limited edition version of the piece, conceived as an artwork, is accompanied by a signed print of the source code and a schematic of the circuit. With Perich’s Machine Drawings the idea of “automatic drawing,” a process of subconscious expression invented by the Surrealists to explore the human psyche, is reintroduced to map today’s human-machine alliances. Visit the 1-bit Music site. Visit the Machine Drawings site. Two of Perich's machine drawings are also on view in the gallery. While many artists have created sonic structures by attempting to play back damaged compact discs, the work of Swedish composer, musician, and artist Erik Bünger is unique in the way it integrates those results back into a live performance. Bünger intentionally destroyed a compact disc of KC & The Sunshine Band’s disco hit “That’s the Way I Like It” beyond recognition, exploiting the fallible construction of a CD by making it the medium with which a new work can be produced. He then painstakingly transcribed its playback into a musical score, written in traditional notation for an ensemble of nine musicians. 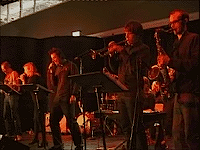 His band performs the score at live concerts. The mediation of musical composition by human performers is commonly problematized in technology-driven works, where humans often provide input into a technological system but rarely mediate that system’s output. Bünger's work reintroduces human hands as the primary mediating practitioners — reinterpreting a pop tune recorded onto a digital device — linking the work back to traditional notions of human expression as the catalyst for musical composition and performance. Jason Freeman’s NAG software utilizes the popular Gnutella peer-to-peer file-sharing network to create real-time sonifications of user-chosen search terms. As matching songs are found, they are automatically added to a download queue. A chaotic mix of downloading songs is generated in real time, based on the bits of data currently being transferred over the network and the download rate of each file. More popular songs are more prevalent on the Gnutella network, so they are found more quickly, download more efficiently, and are therefore more prominent in NAG's auralization. But in an ironic twist (or perhaps a mirror of reality? ), the most popular songs are often found and downloaded so quickly that the initial Top 40 collage eventually gives way to a quieter, gentler mix of more obscure tunes. Mathematician Benoit Mandelbrot coined the term fractal in 1975 to describe a mathematics of self-similarity and recursion which can generate complex structures from simple premises (such as the Mandelbrot set, pictured at right). While fractal mathematics is usually deterministic (i.e. the same generative process will always produce identical results), fractal structures are nonetheless chaotic, complex, and unpredictable. In fact, many computer-based random number generators are based on fractal algorithms. As Mandelbrot noted in his seminal 1982 book, The Fractal Geometry of Nature, fractals are not merely mathematical exercises that sometimes create pretty images; they are closely connected to structures of nature. The self-similar geometry of snowflakes is modeled by Koch’s fractal curves, and the self-similar, branching growth of plants is captured by the recursive iterations of Lindenmayer systems. Other fractals, such as the Mandelbrot set, connect more abstractly to nature in their dependence on the self-similarity that is so prevalent in the natural world. Numerous composers have used fractals to generate musical material, but most have merely grabbed successive rows of pixels from an image of a Mandelbrot set and mapped their values onto pitch and rhythmic data. Nick Didkovsky, a New York composer, software designer, and electric guitarist who creates music for concert performances, club events, and interaction over the Internet, developed a more sophisticated representation of fractal processes for his MandelMusic web site. Didkovsky opens up the work to user interaction and provides a framework through which other composers can extend his ideas. Rather than tediously sonifying successive pixels, the web-based software lets users choose a starting point and then listen and watch as the Mandelbrot equation is recursively applied. And rather than creating music from a simple, fixed mapping, Didkovsky has invited other composers to create their own plug-ins to sonify each point as it is visited. To date, ten composers have contributed sixteen plugins exploring a variety of musical techniques. Though it is inspired by the same self-similar structures of nature as Nick Didkovsky's MandelMusic, this web site from New York avant-garde composers Jeff Snyder and Eric Wubbels has a decidedly more humorous bent, as one glance at the "Axlbrot" version of the Mandelbrot set (right) should immediately convince. The project manages to poke fun at both obsessed music fan sites and at the often short-sighted appropriations of mathematical techniques by so-called serious musicians, both of which seem to be topical formulas for success. The MP3s at the heart of the project are generated by a straightforward self-similar process. 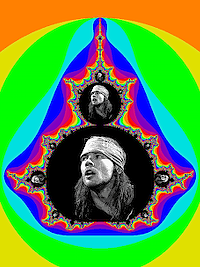 Entire Guns N' Roses songs are sped up as much as 480 times each, so that each song lasts only a fraction of a second. These sped up versions become individual notes (keys) of a digital sampler, which is then used to play back MIDI files of Guns N' Roses songs. Mediation Station is organized by Rebecca Uchill and Jason Freeman for the Perform.Media Festival.